This is a rare American Victorian silverplated jewel box. The drawer revolves outward. 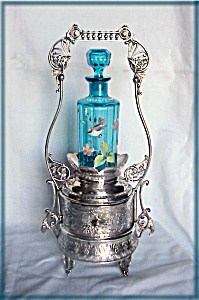 The beautifully enameled blue perfume is decorated with flowers and a bird and features a matching stopper. The resilvered jewel box was manufactured by Rockford #1961.